Softdisk which has the history of constantly upgrading its information thru various surveys has been monitoring the UPS industry for well over two and a half decades now. We have become synonymous with the UPS Industry and are constantly on the lookout of data. According to our latest findings, the Indian UPS market which is currently growing at just over 6.21% is expected to cross 6500 crore mark by March 2019. This include around 200 crores of sales coming through unorganized sector. By March 2019 the industry is expected grow by 6.45 % which is higher in comparisons with overall market growth which grew by 5.27% in the previous fiscal. A growth of over 1% over last year. For sure 18-19 will outperform the previous three fiscals. How individual companies benefit depends solely on their approach. Companies looking for bottom line will have to face pressure form companies looking to improve top line. How ever if survey is a an indicator that private sector will open up during & post festive season making it little suitable for those looking for bottom line. Banking sector will be a cause of concern as they insist on lowest bid. I had lot of complaints of not getting proper service, I met DIT purchase of many banks explained them that service is related to purchase price, when companies sell at very low margins they find it difficult to service after 2 years. There is further scope of consolidation, with big companies not hotly pursuing lower kVA products. Also the amount of consolidation taking place in the Industry, probably is due to fact the more & more UPS companies are experimenting with solar enabled UPS & SPCUs. This time a lot of emphasis was given on low key players who are in search of different market share for example like Cosmic, Powernet, TPC, Arrow, Suvik, Vespra, ARVI to name of few. In financial year 2018-19 the total end user sales should at around 6500 Crore. A GREAT ACHIEVEMENT IN THIS COMPETITIVE PRICING TIMES. This is exclusive figure for UPSs (Sales, Services & Maintanence) & Power Electronic Devices, excluding cooling solutions, home UPSs and other add-ons with GST. This is suggestive of the fact that Indiaâ€™s growth engine has started functioning, at a bit faster then previous financial. To counter the increasing prices of batteries many a companies have started sourcing the batteries through OEMs, although still the quality conscious customer insists on branded batteries. These estimates have been generated by a survey when the industry was seemingly at the end of a tough phase post GST implementation & Complaince, where we had mixed reaction form manufacturers and customers alike, through a tough phase after experiencing a tremendous drop in Rupee against the US$ and hence might have a 2 to 3 % aberration. Softdisk believes that the current expected rate of increase by approximately 6.45% & overall turnover by March 2019 including unorganized sector will touch 6500 crore mark. However nearly 250 crore of this will be through unorganized sector surely indicating that end user consumption of organized companies product will in all probability will cross 6200 crore mark even at the worst of its performance. BIS compliance is another key factor, in reducing the competitions and increasing margins. More Modular UPS will be in demand and line interactive market will slowly decline it will difficult for companies to maintain the current sales level. Modular UPS allows end user to invest according to their actual load, and to upgrade their systems while their business grows, without hampering uptime, reliability, availability. The market demands UPS system with high efficiency even at partial load to reduce the operating cost and to be a part of green revolution. The report has been generated by talking to more then 600 companies under various vertical and talking to over 350 people who are direct decision makers. All 600 plus companies we talked to had near 200 employee strength and have presence in almost all the regions in the country. There is an indication for more demand for single phase up to 20 kVA (around 60 %) & Three phase UPSs (around 40%). Off all this Modular UPSs share is about 35%. Demand for Industrial UPSs will slowly rise. Rest of the revenue being accountable for services and other equipments. Survey shows that this shift towards Modular UPS is primarily due to the hot swapping features & the flexibility they offer in terms of redundancy. But this trend is mainly for Corporate, IT & ITES companies. The market demands UPS system with high efficiency even at partial load to reduce the operating cost and to be a part of green revolution. The firms in India will have to make great leaps in application integration. In addition, India's cultural diversity, corporative federalism, and socio-economic disparities make it a microcosm of the broader South Asia region. Softdisk expects, smart vendors to use India as a testing ground for new business models and strategies to try out models for the next wave of emerging economies. Though India & South East Asian economies are closely connected to each other through trade and cross investment, they differ enormously in their levels of economic development and the state of their IT infrastructure. NORTH : Last year the over all Northern market had grown by 6%, we expect it to go up by 8%. Leave apart power continuity, availability of Power especially in states of UP & Bihar has been a point of concern. There will a marked raise in Government purchase in the north. (Allready visible) Followed closely by IT, ITES and BPO segment. SMB will also be a significant contributor especially in the state of UP, Rajasthan & Bihar. Overall North will contribute 24 to 26% of expected 6500 crore by March 2019. SOUTH : Here a surge of nearly 4% is expected in coming two years. 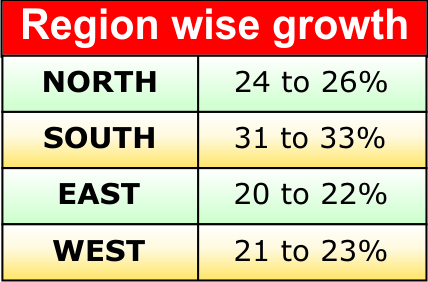 South is expected grow at a rate of 31 to 33% and will contribute over 2000 crore INR to the UPS revenue of the country by March 2019. Off this Karnataka, Tamilnadu & Kearla will be the major contributor. However a new state of Semandhra & Telangana will not lag behind but for this supports from the center will be one big factor. In this Semandhra seems to be at an advantage. Other then Banking, one can expect Corporate business to be contributing more and IT / ITES, BPO's to contribute revenue in these states. Education, will be another major contributor. EAST : Nearly 1400 crore revenue will be generated by the sales of UPSs in the East by March 2019. Govt. buying will dominate, many a planned projects will start getting executed. In the overall scenario East will be contributing somewhere between 20 to 22% of total revenues by March 2019. WEST : In the west overall contribution will be some where between 24 to 26% of the total national UPS revenue. West will pocket over 1600 crores of the total revenue of 6500 crore by March 2019. Major contributor will be Govt. buyings will contribute 31% of West revenue, Gujarat & Corporate buying and IT / ITES, BPO's & Services & Industrial Process Automation will be major contributor nearly 30% of revenue will be churned out by this sector. SMB will be a major contributor in Madhya Pradesh. 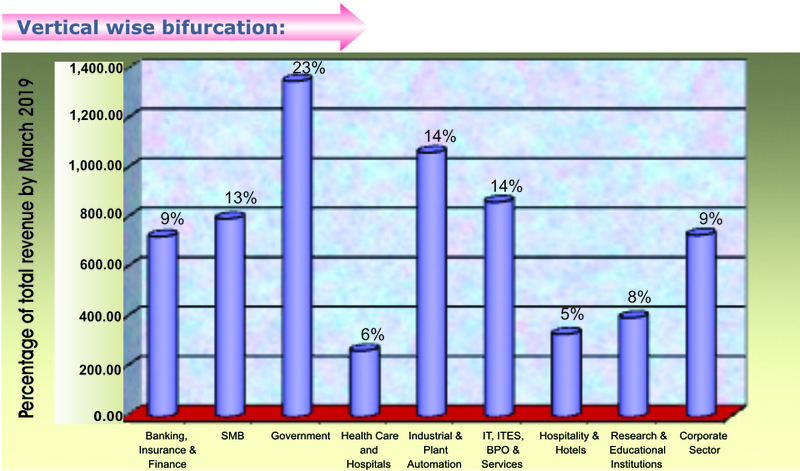 This indicates Banking, Insurance & Finance sector contributing 9% approximately 728.72 crore INR. Other major contributor being the government sector which is expected contribution being well over 1357.42 Crore, nearly 23% of the total UPS revenue. indicating a gain of 2% over previous year. IT / ITES & BPO sector contribute as last year The sector is expected to net 868.10 Crores, a share of nearly 14% in the overall UPS revenue. While Corporate buying shows the decerase of 2% in percentage in percentages terms & is expected to grow at the rate of approximately 9% netting revenue of above 734.54 crore. Over all increases of nearly 50 crore in revenue terms. Another major contributor this year will be Industrial process automation with high capacity CNC Machines being installed high end UPS systems which can use regenerative load as in put source will be more popular. A clear increase from the last year level. The trend indicates that those selling higher kVA ratings will be the one to watch out for as they may clinch the CNC deals. Those coming up with cutting edge technology will be at an advantage. Companies selling to Govt. concerns will be at a benefit. Research & Educational Institutions will be a key area of interest to those catering to their needs, this sector will contribute over 400 crore. Hospitality sector will have there own share of the pie. SMB segment contributing over 800 crore nearly 13% augers well for the small players with the small UPS systems, there is still a lot to vie for, if they have commitment to quality. Softdisk is proud of the fact that the SMB segment will be contributing over 800 crore indicating that its effort to educate the masses over the period of last two & half decades, has finally started paying dividends. You pat us or not, we are certainly patting our back.